Sega's Dreamcast gem coming sooner than expected. One of the coolest things about Sega's Dreamcast console (RIP) were the quirky and off-the-wall video games that debuted on a seemingly regular basis, with Jet Set Radio at the very top of the list. 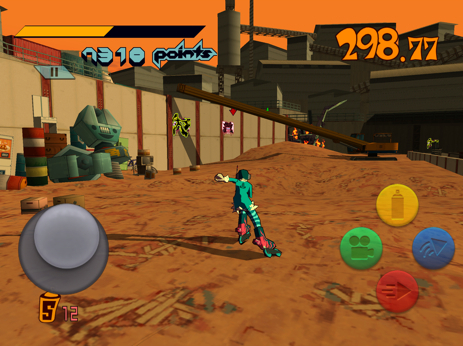 Known as Jet Grind Radio in the U.S., this cell-shaded romp sent players skating through Tokyo, sticking it to the man by spraying various areas with graffiti. Not only did the game look sweet, but the soundtrack really put this title on the proverbial map, the addition of Rob Zombie's Dragula excluded. That said, we learned a few weeks ago that Sega would bring Jet Set Radio to portables, and now we have dates. The game will officially appear on iOS and Android November 29, and Vita November 20. We're a little concerned about how well the game will adapt to virtual controls, but we'll find out soon enough.